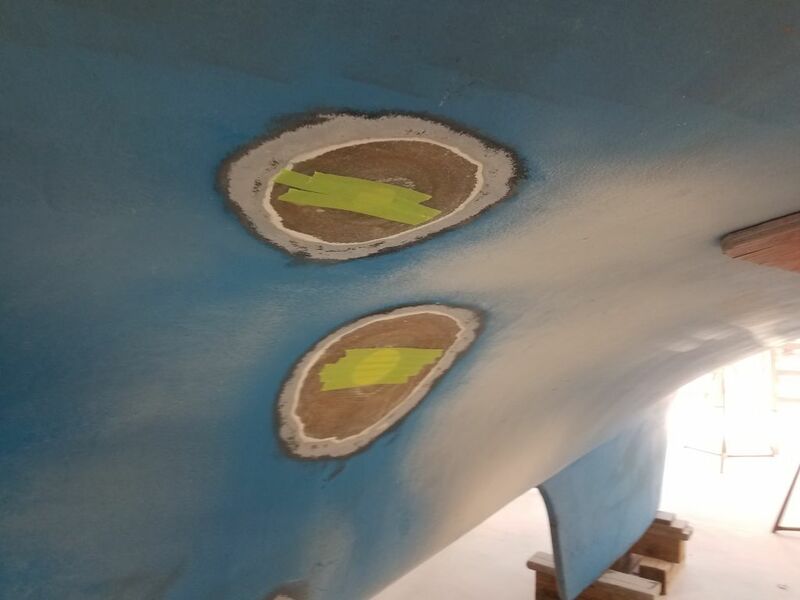 First thing, I sanded all the deck areas as needed, removing excess fairing compound from the various areas currently underway. 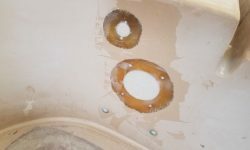 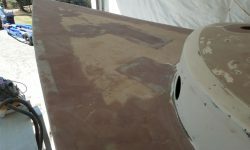 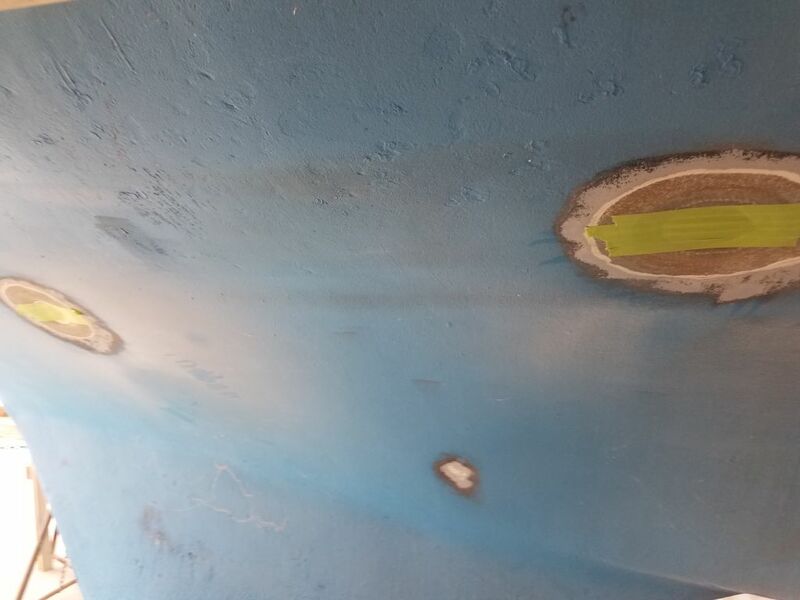 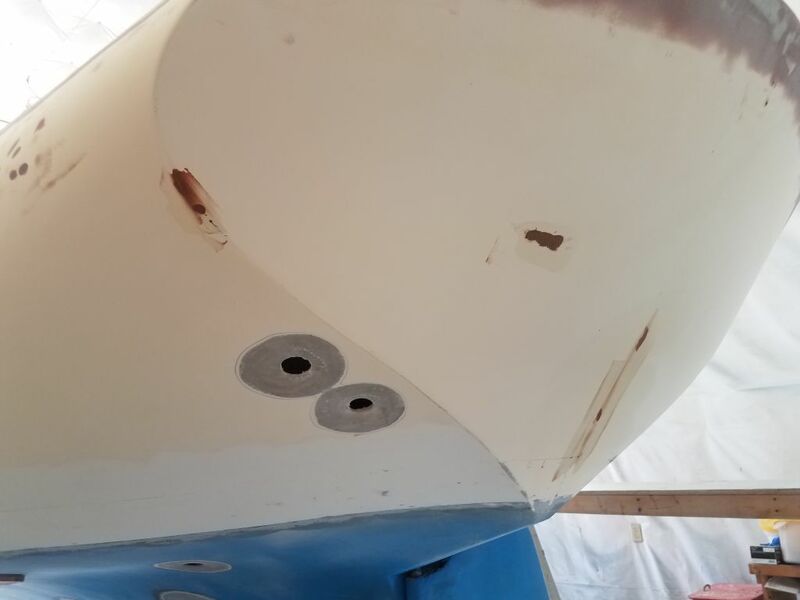 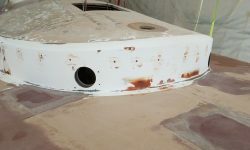 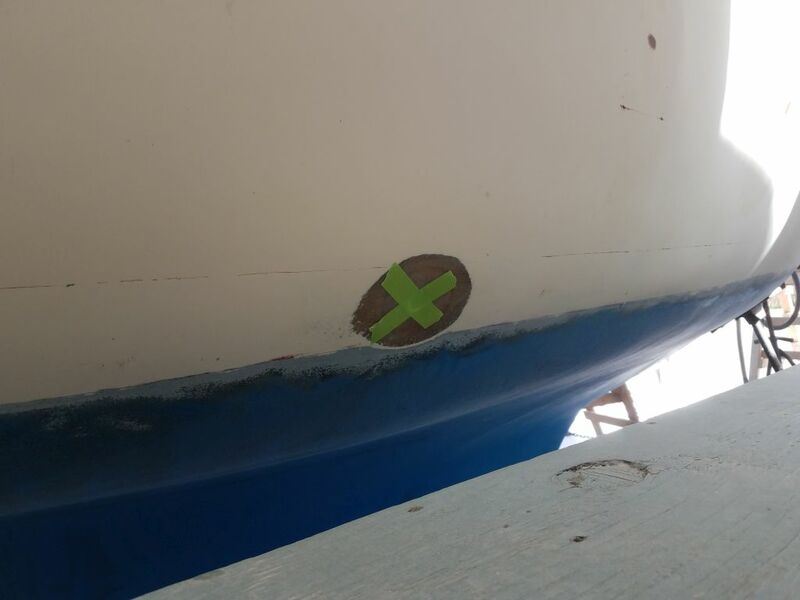 Most of the fastener holes and small repairs would require some additional fairing work, as expected. 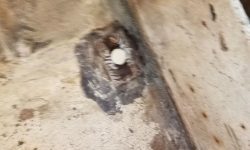 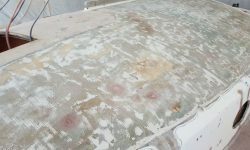 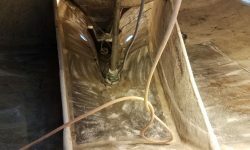 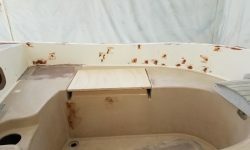 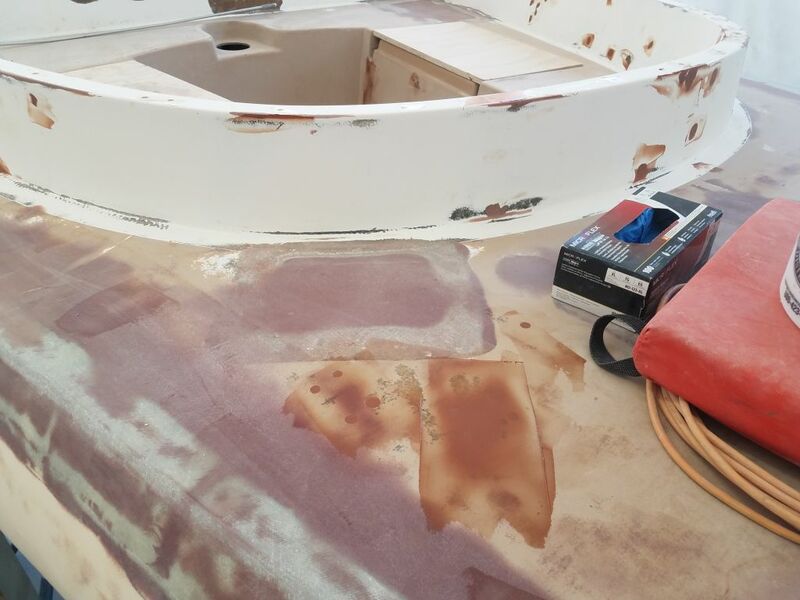 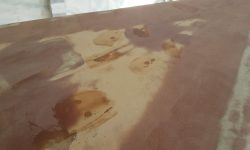 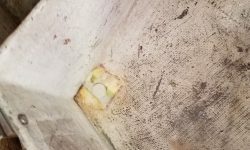 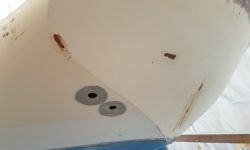 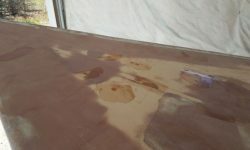 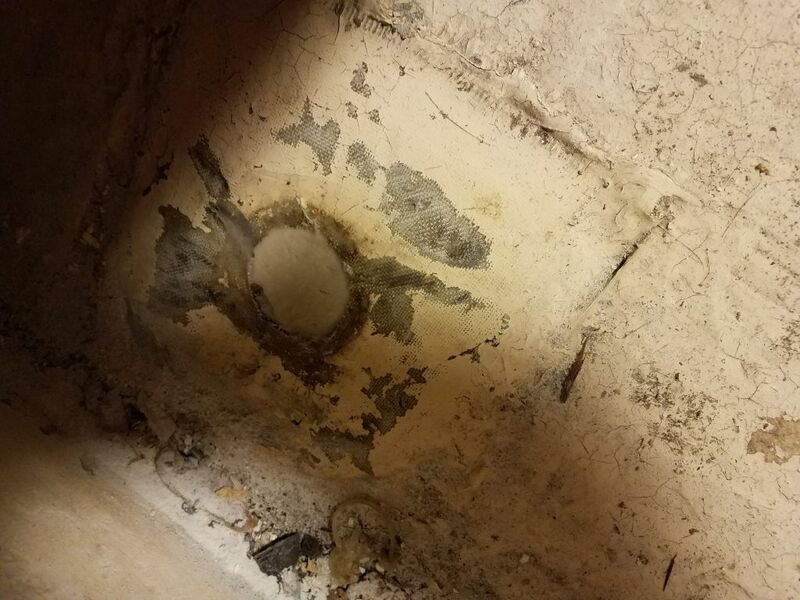 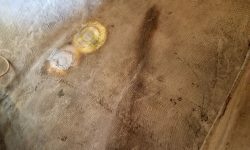 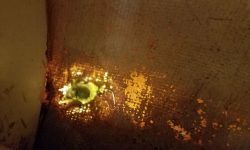 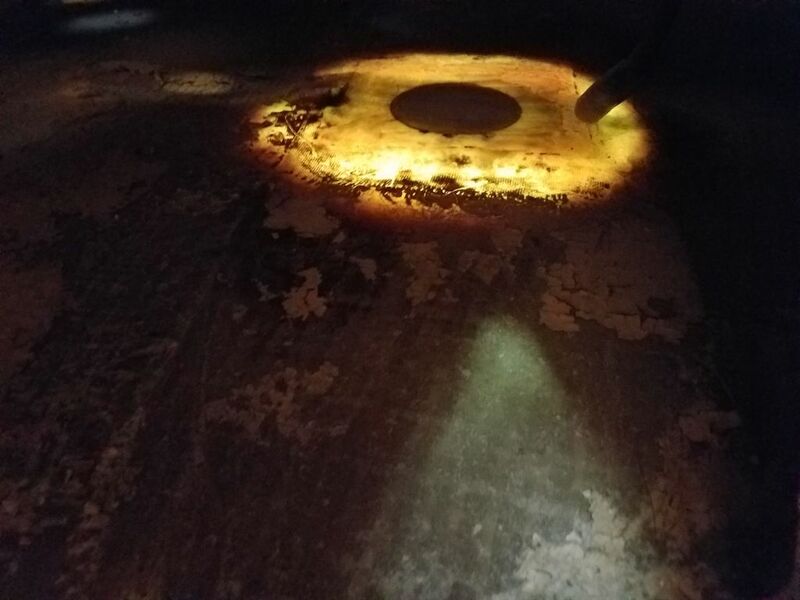 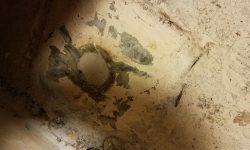 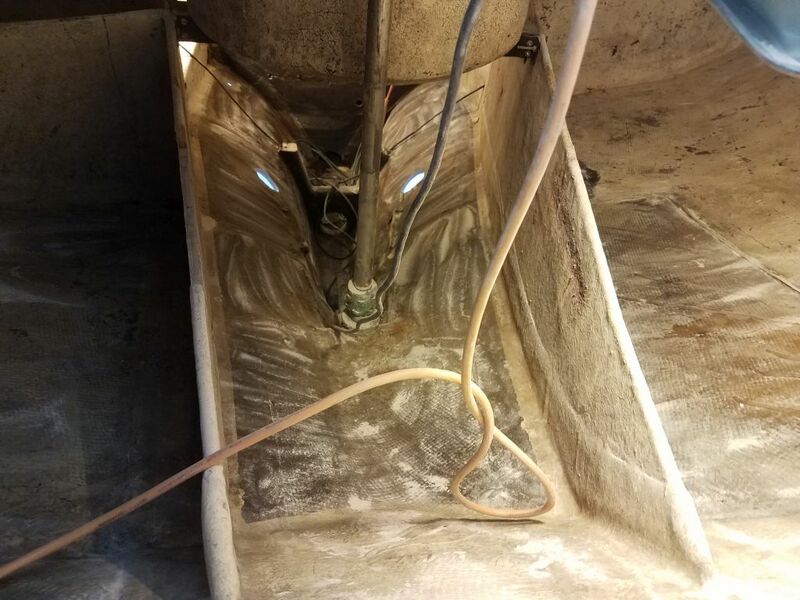 This time, in addition to cleaning up the decks once I’d finished sanding, I spent some time cleaning the bilges, interior, and related spaces, where I’d not really ventured in some time and which had become a Stygian mess. 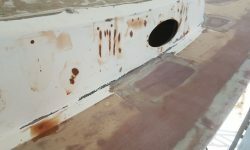 With some of the upcoming work soon to require my reentry into the cabin and other spaces, it was too dirty for anything, and I had to make it at least remotely habitable by cleaning up the extensive dust, core debris, and other detritus that had accumulated over the past several weeks of intensive deck work. 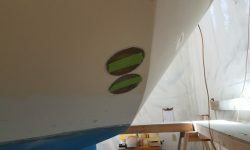 After a solvent wash, I went around the decks and applied additional fairing compound as necessary, mainly focused on the cabin trunk and cockpit coamings with their myriad small repairs, but I touched up a few areas on the main decks as they became evident. 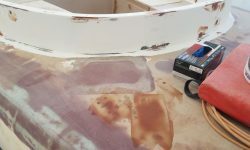 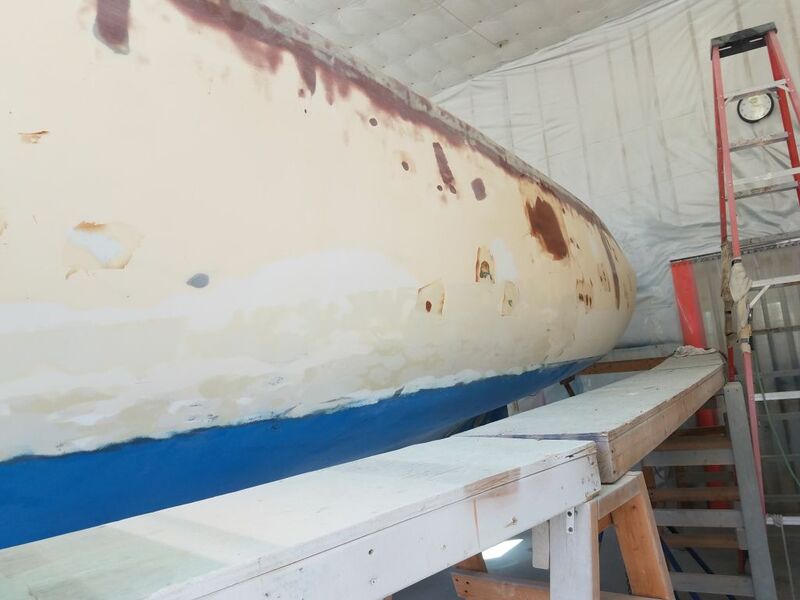 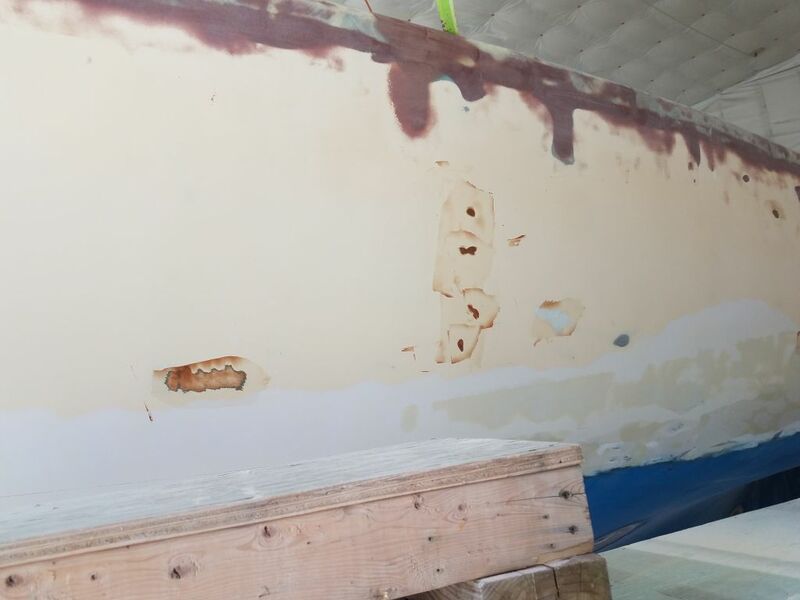 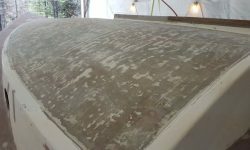 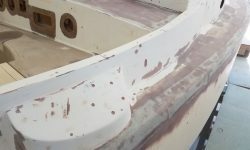 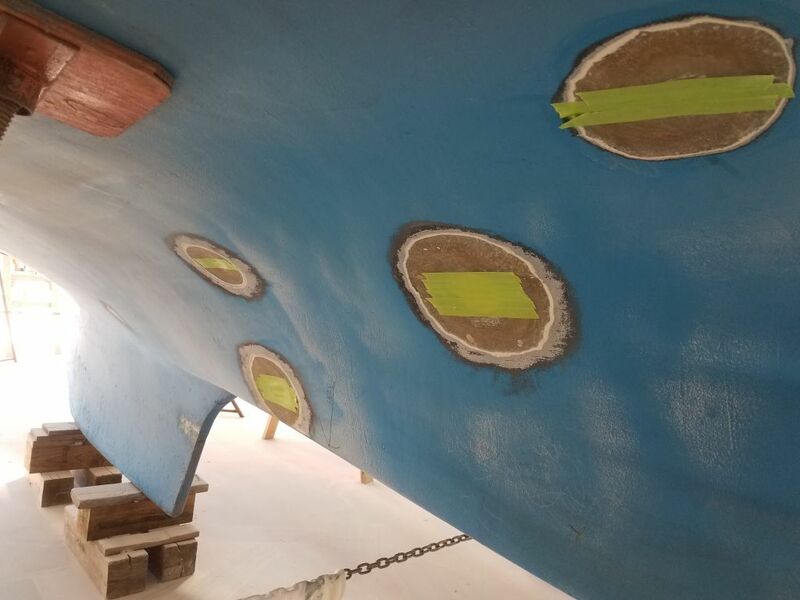 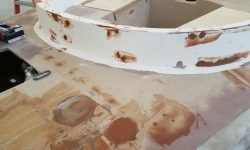 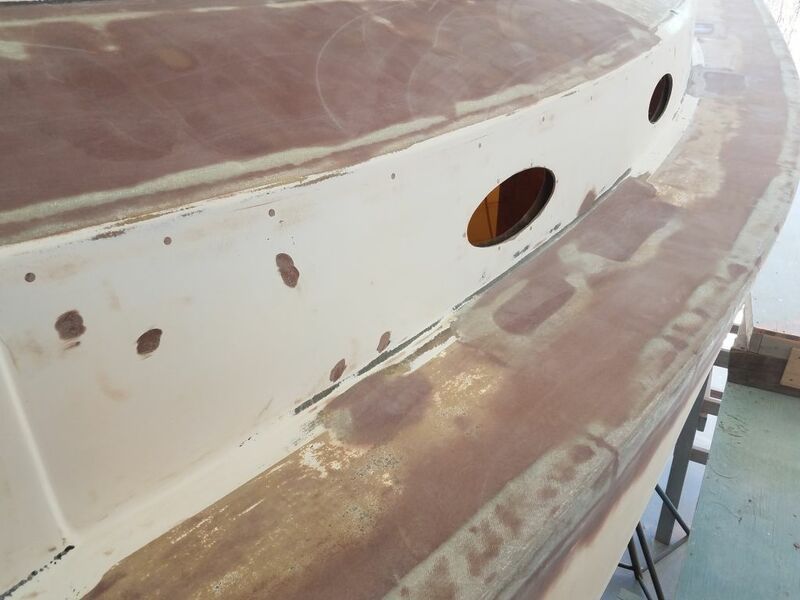 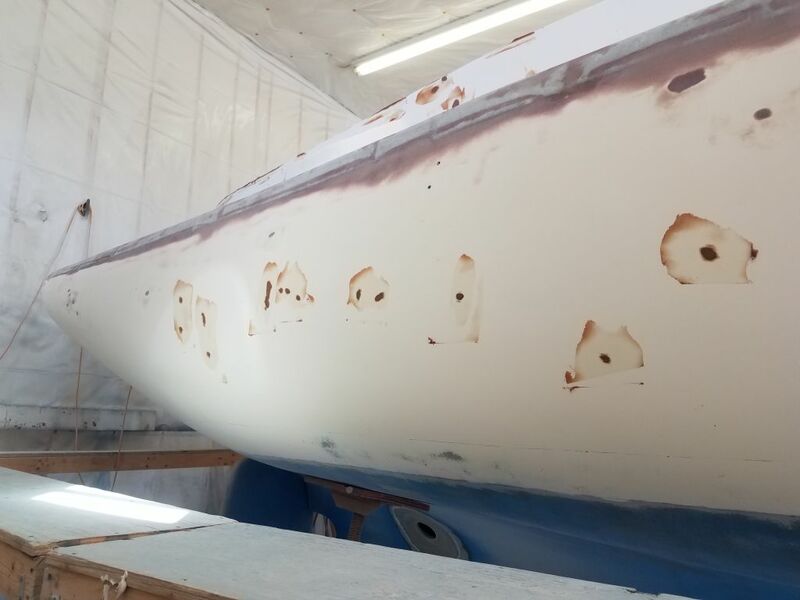 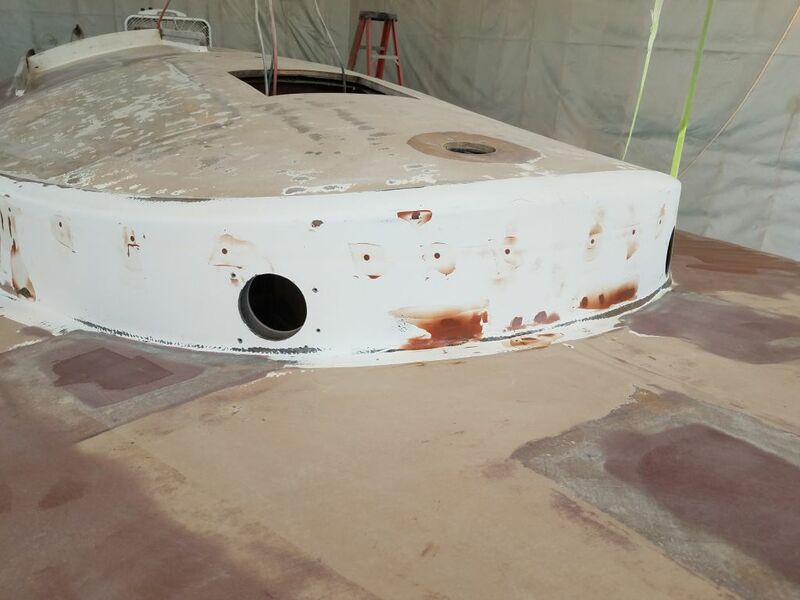 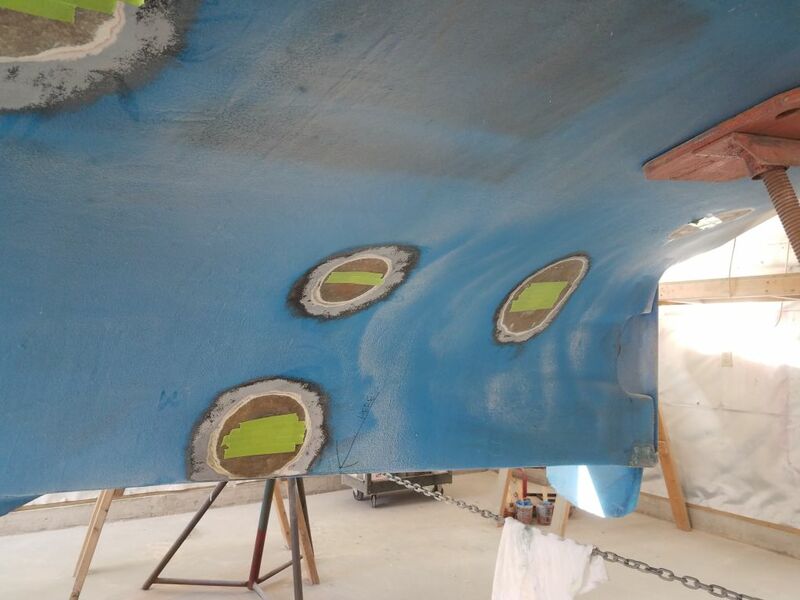 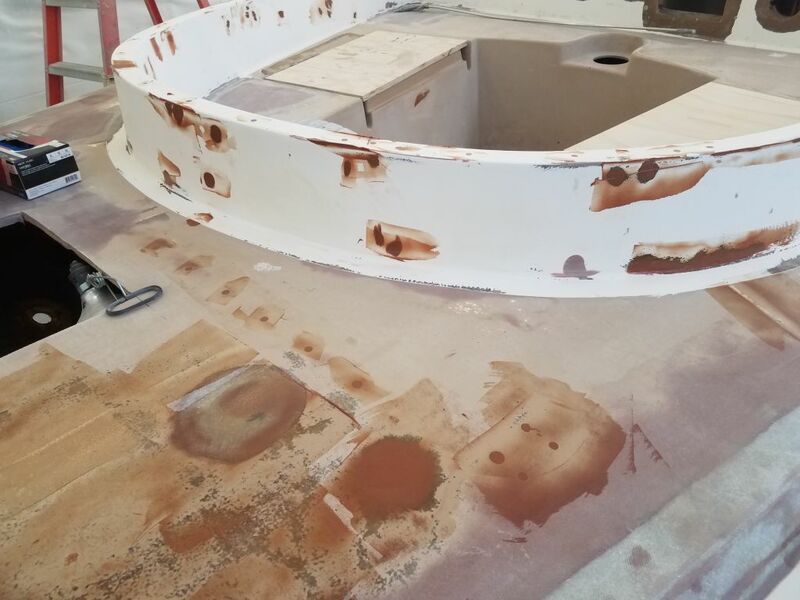 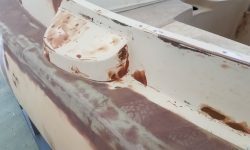 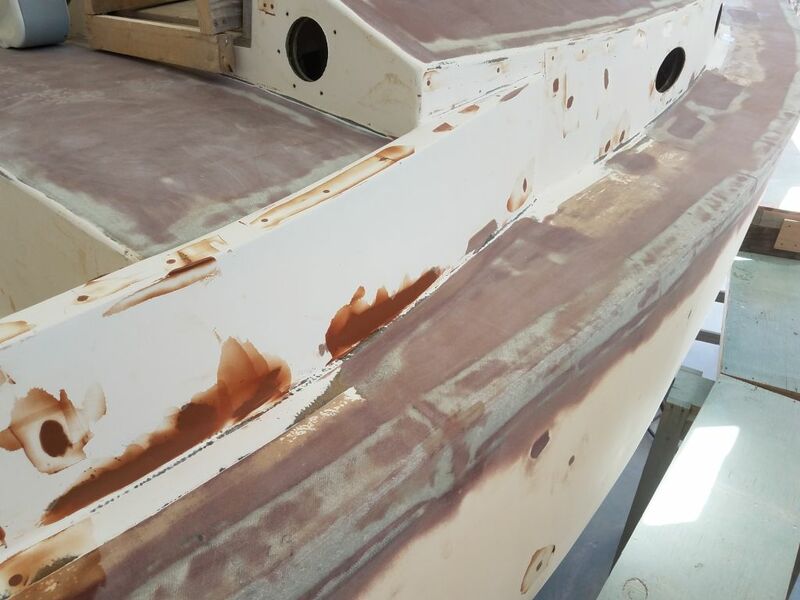 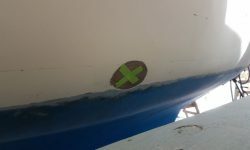 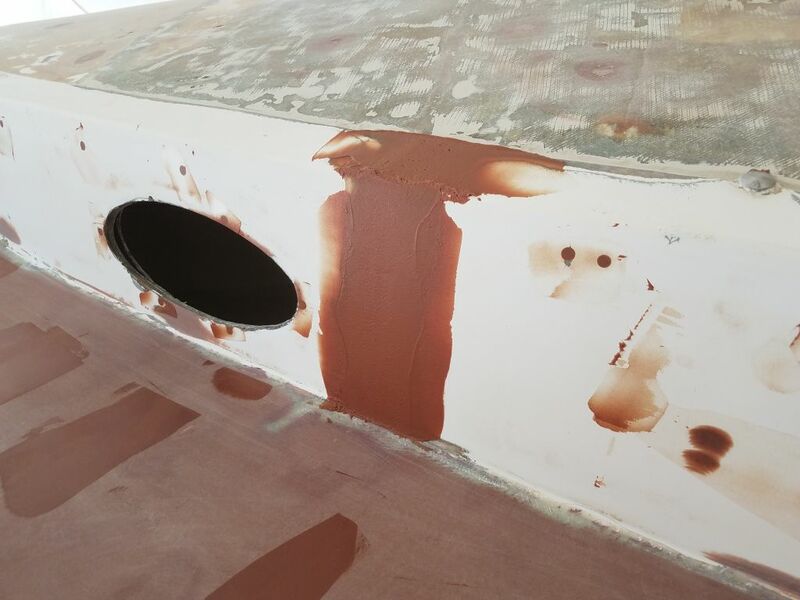 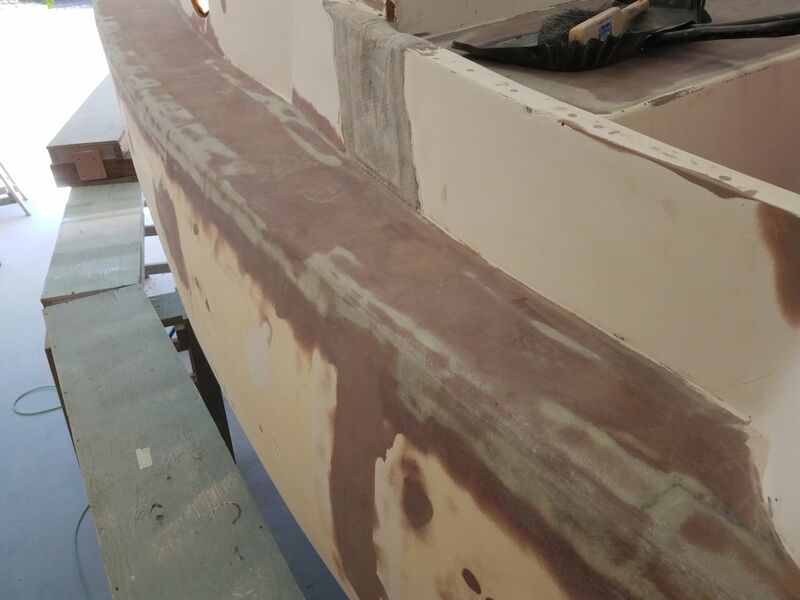 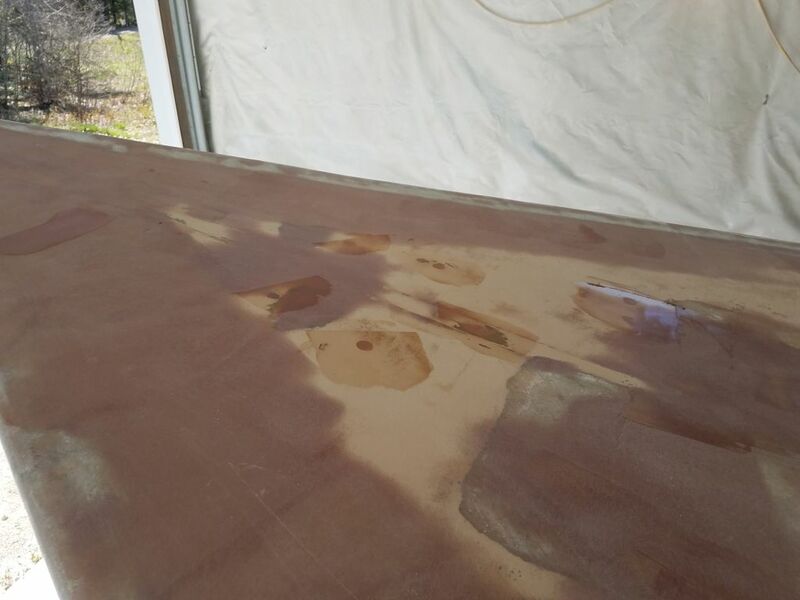 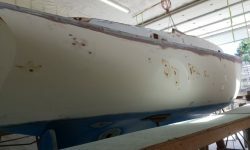 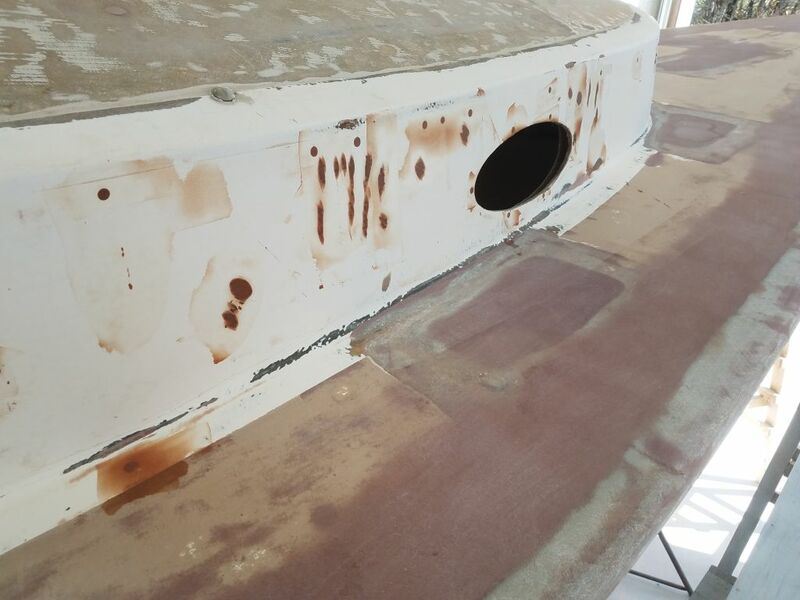 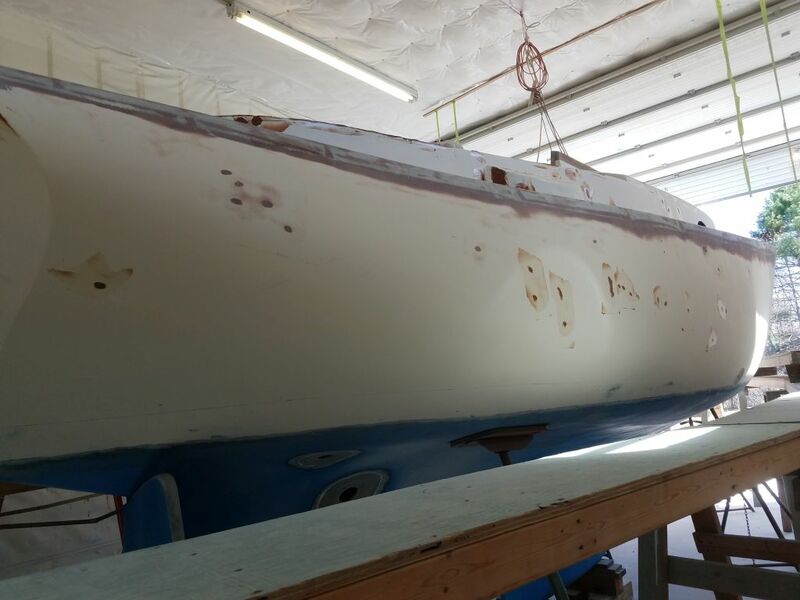 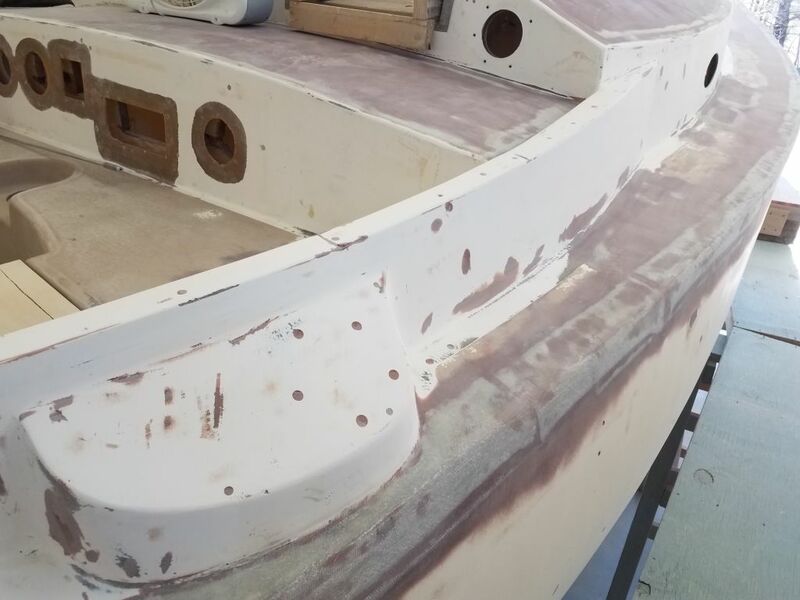 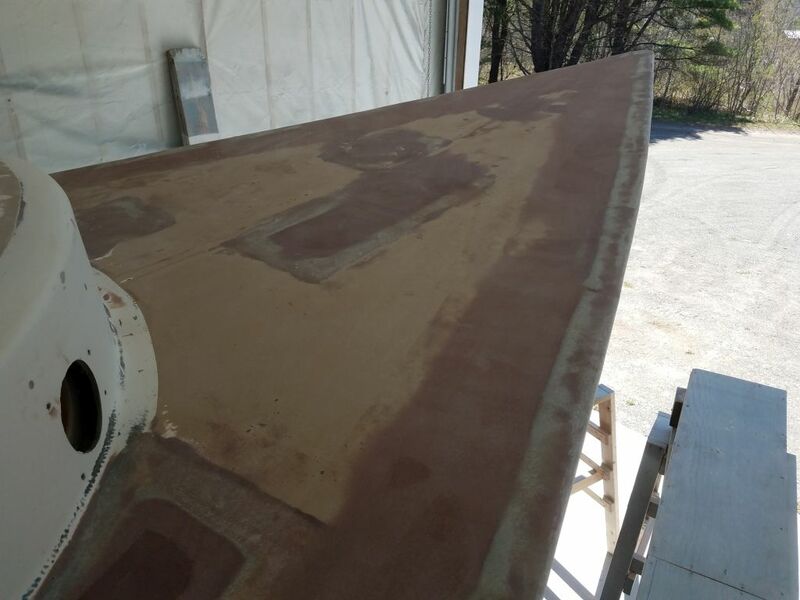 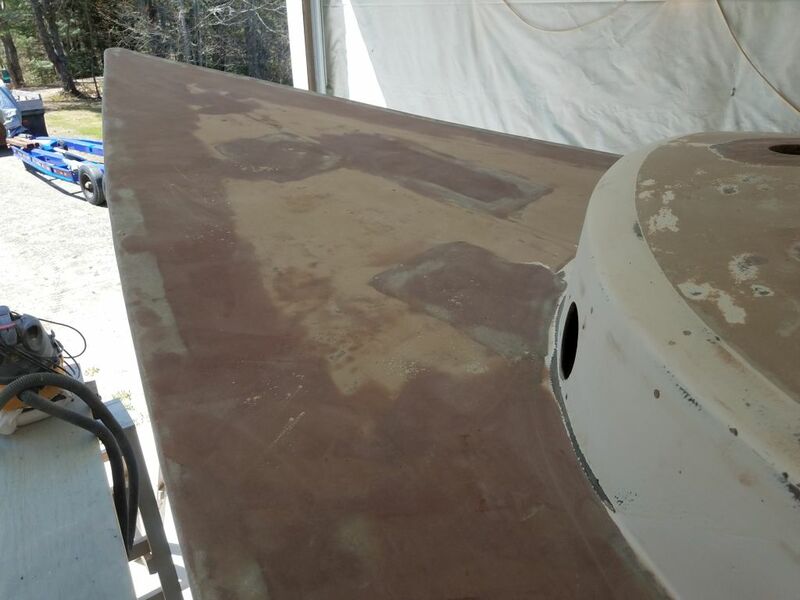 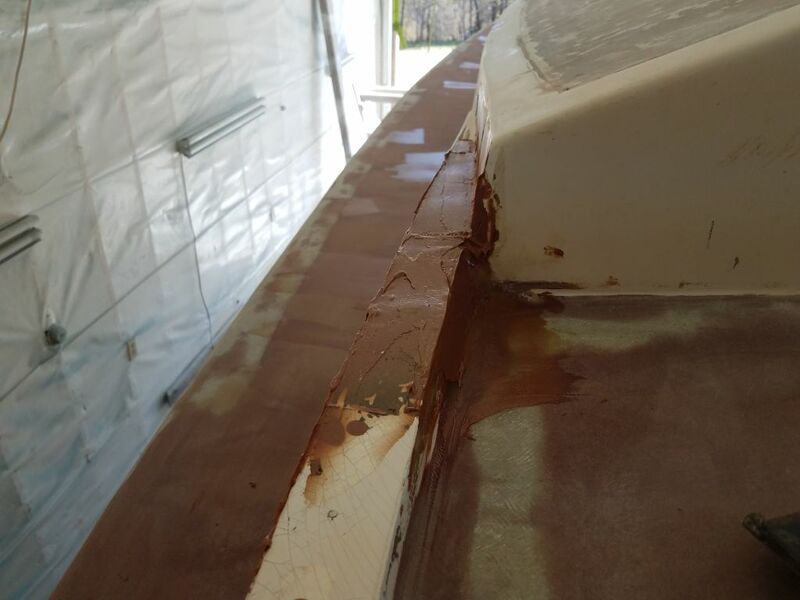 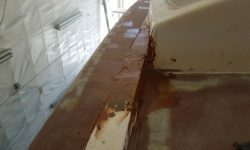 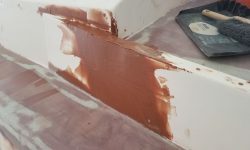 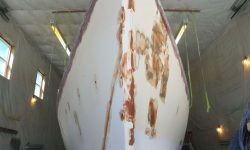 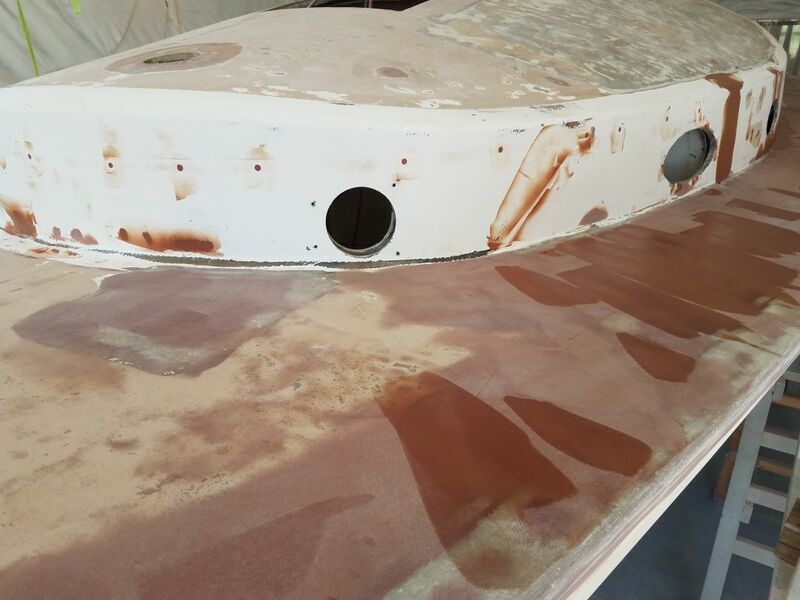 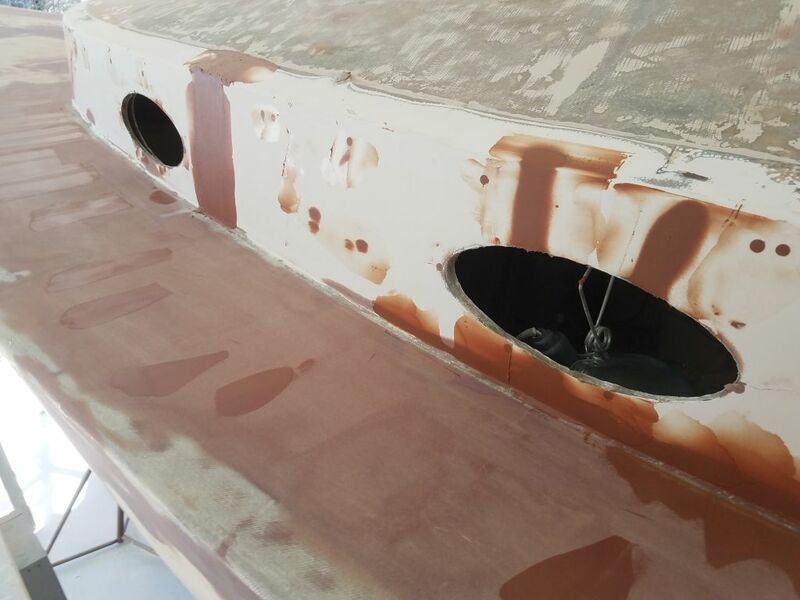 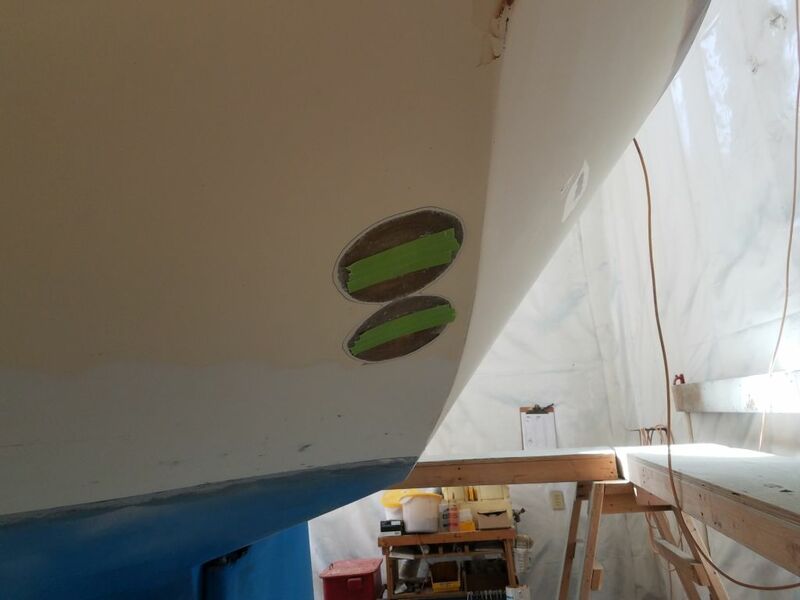 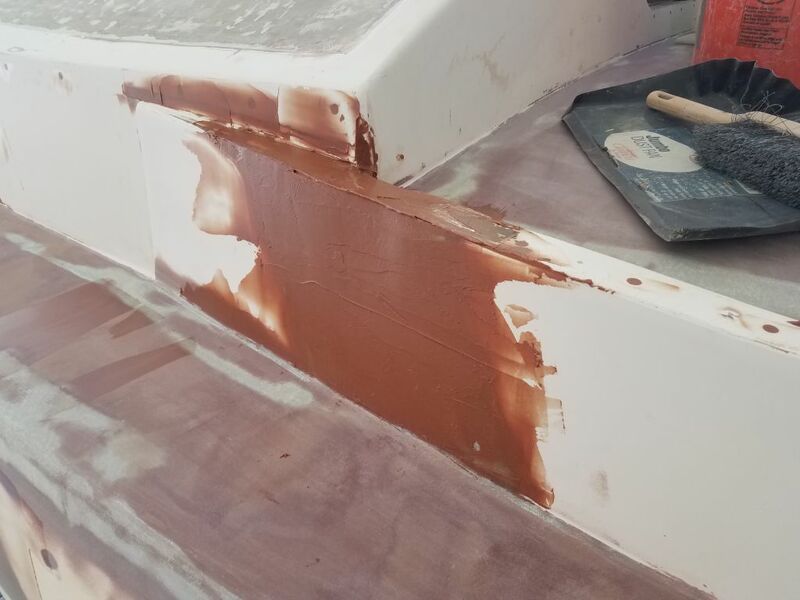 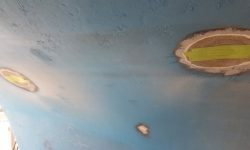 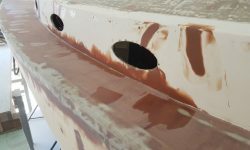 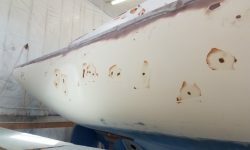 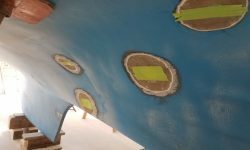 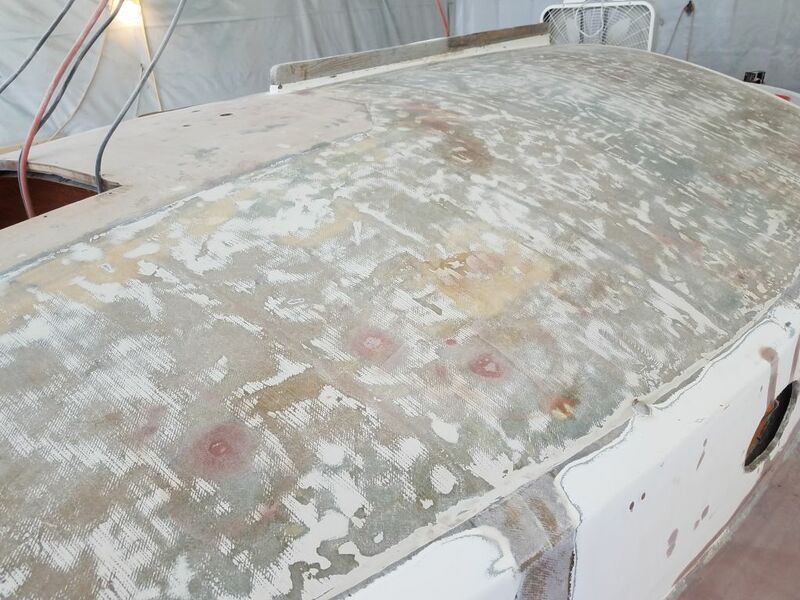 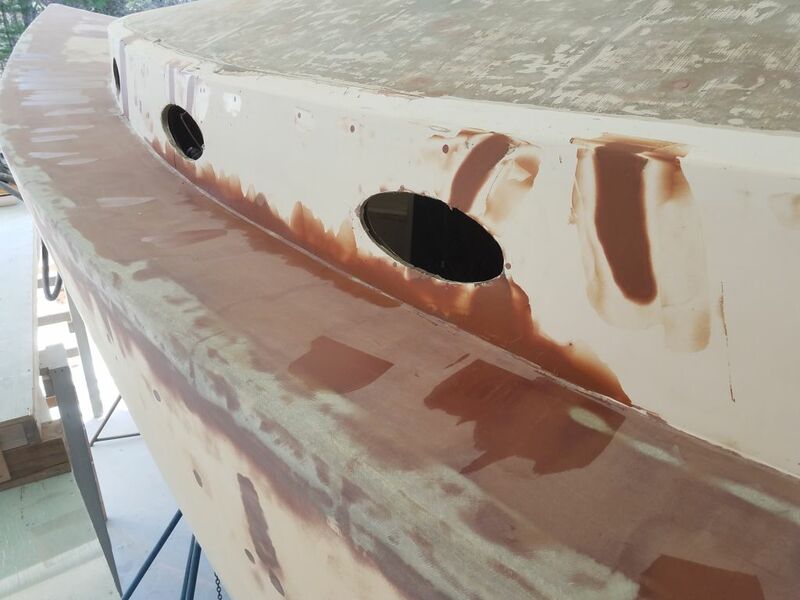 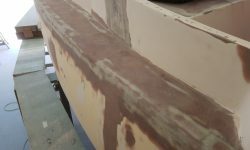 It seemed like as good a time as any to apply a first coat of fairing compound to a number of small places I’d ground out on the hull during the early stages of the project. 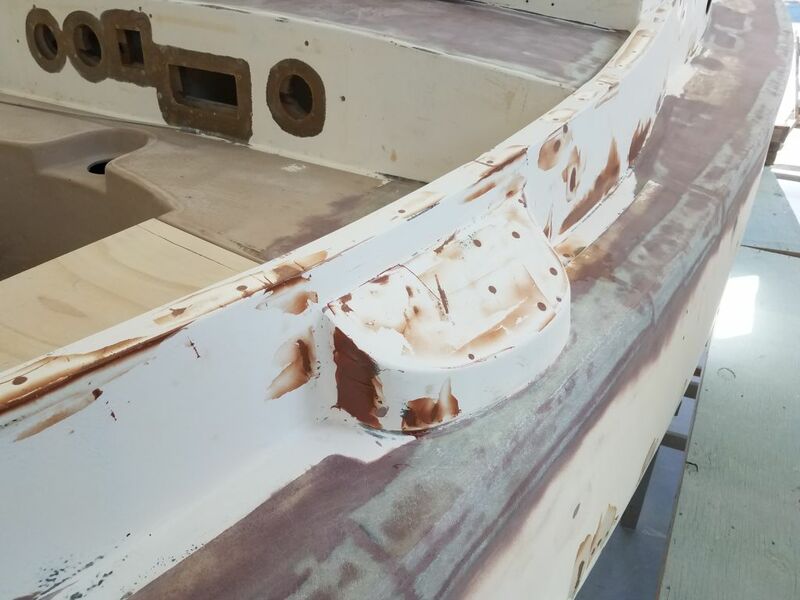 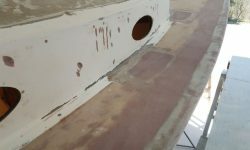 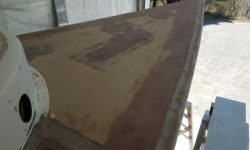 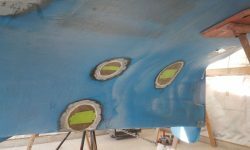 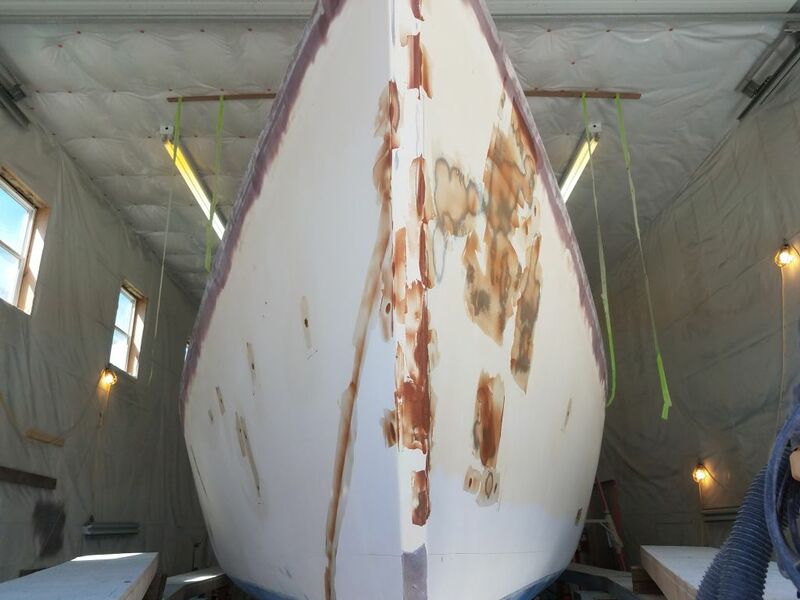 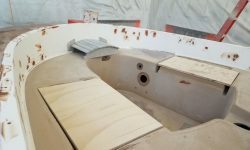 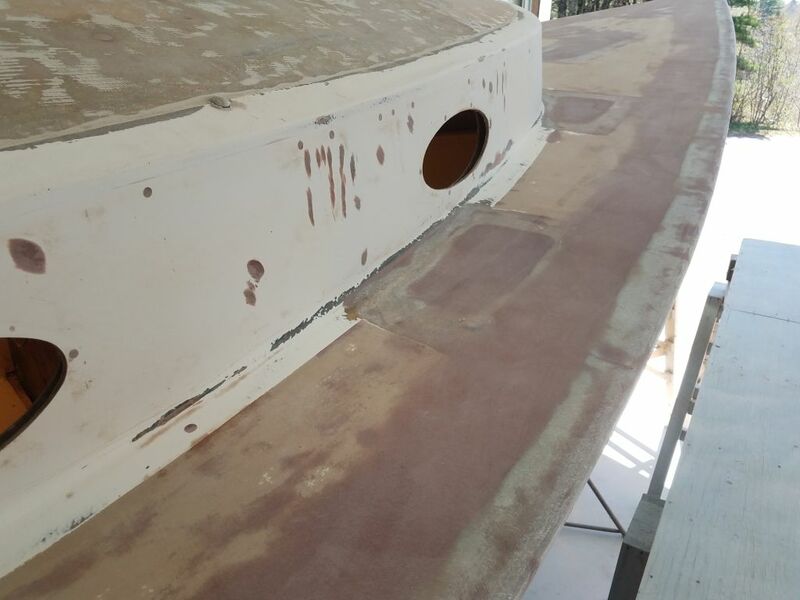 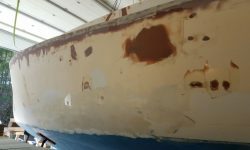 I’d worked on some of the uppermost sections while I was rebuilding the hull/deck joint, and now I went around the rest of the lower sections of the hull to begin the repairs on the remaining divots. 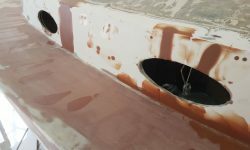 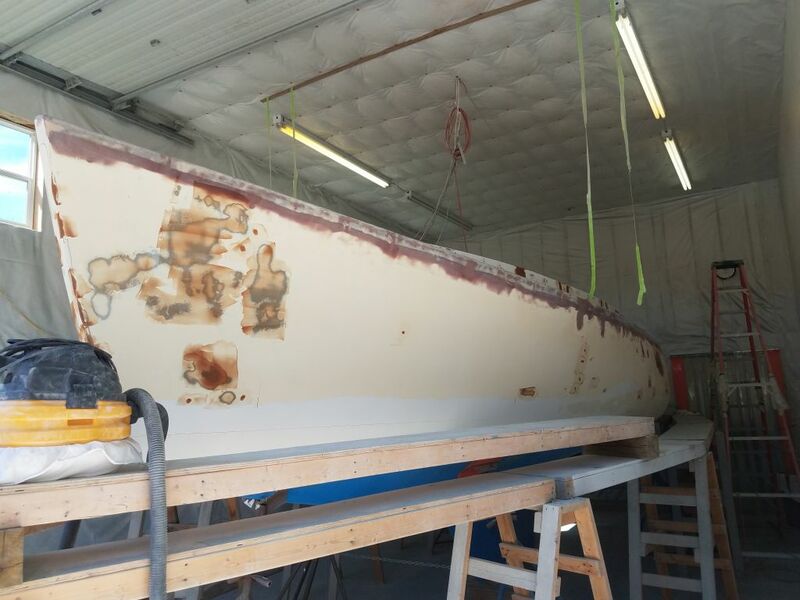 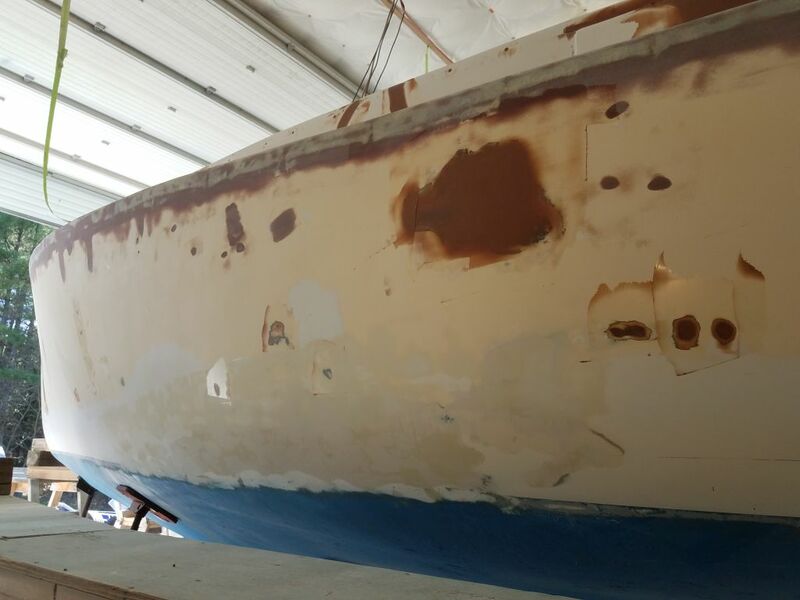 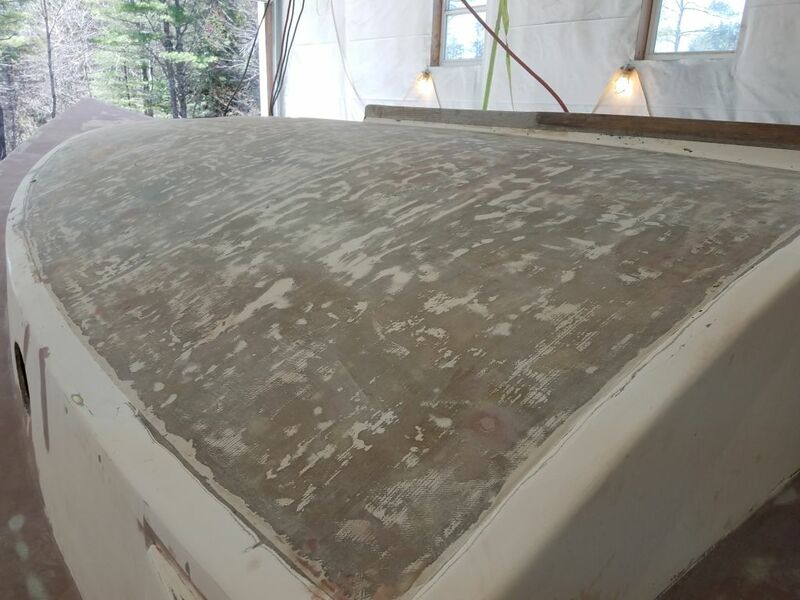 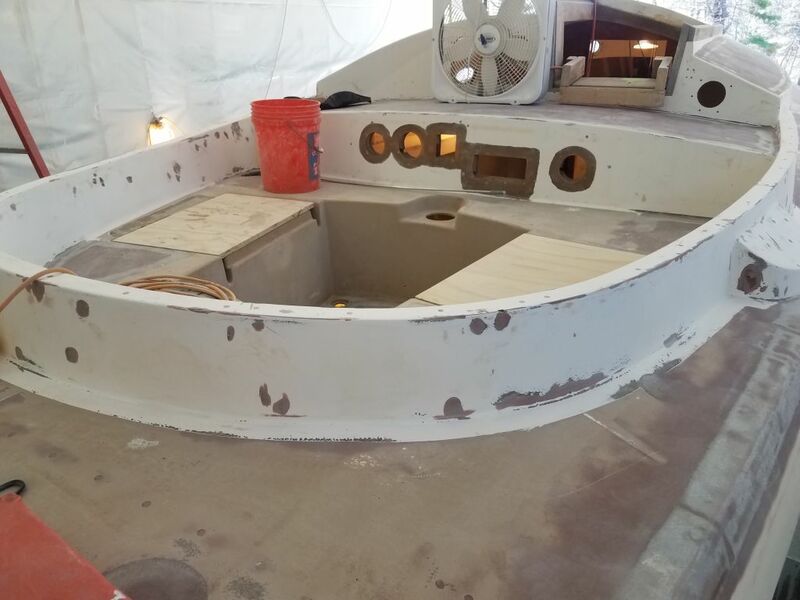 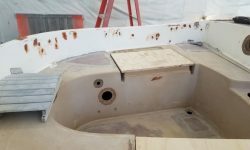 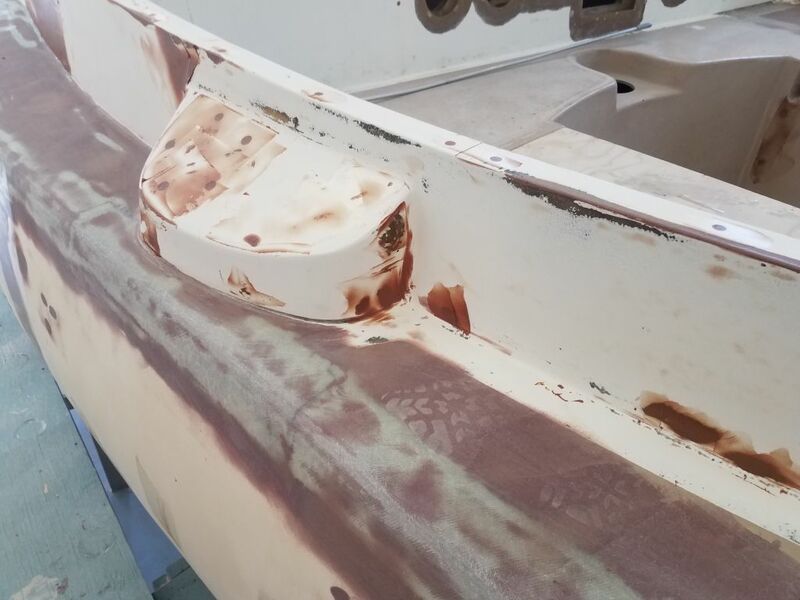 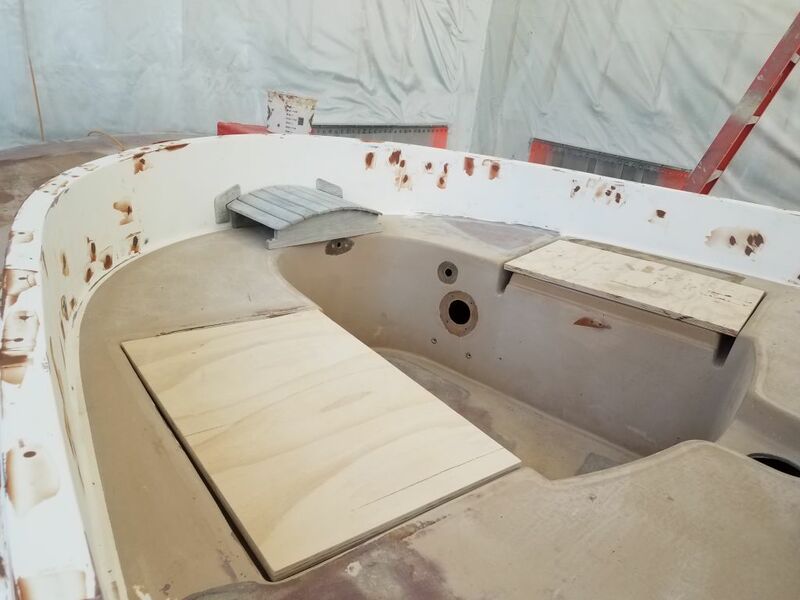 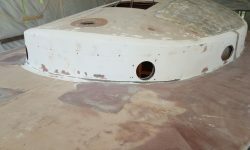 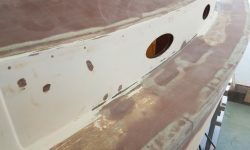 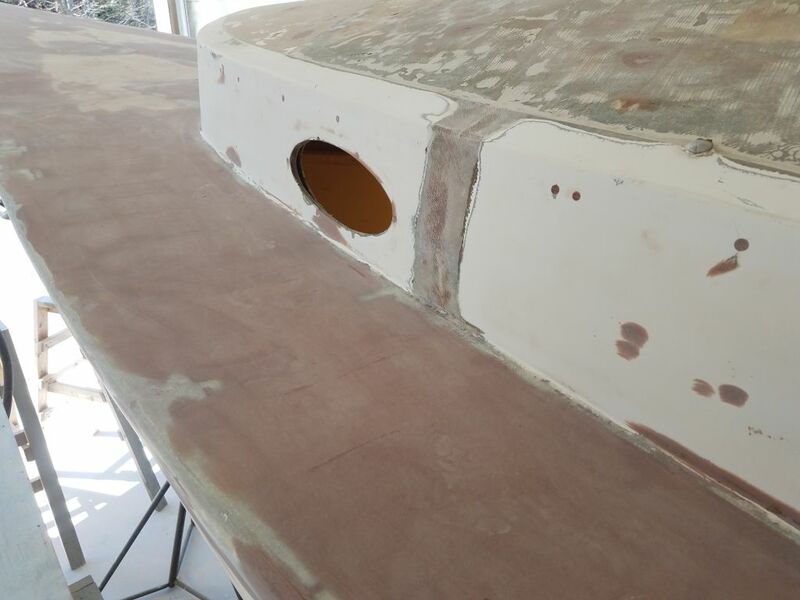 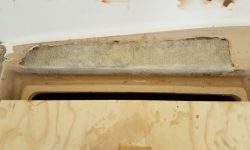 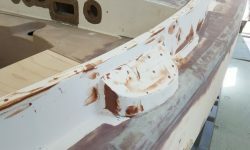 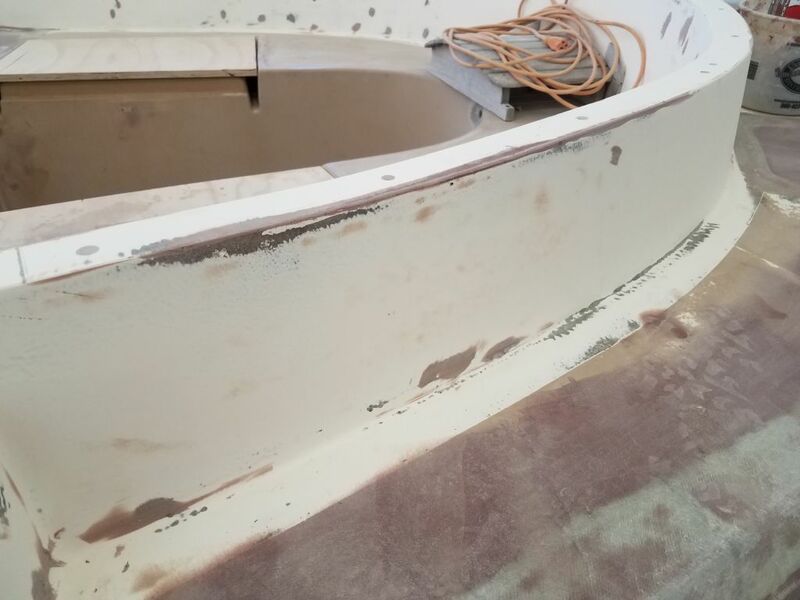 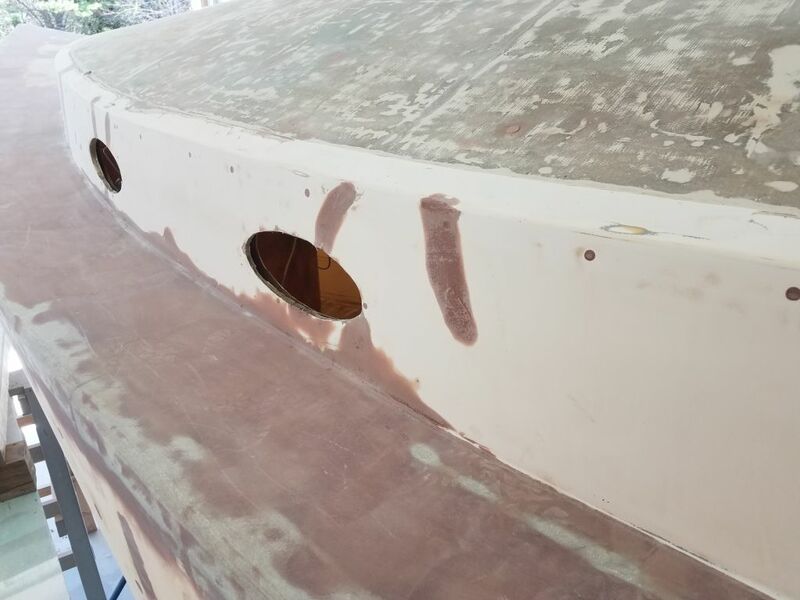 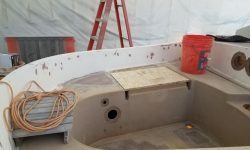 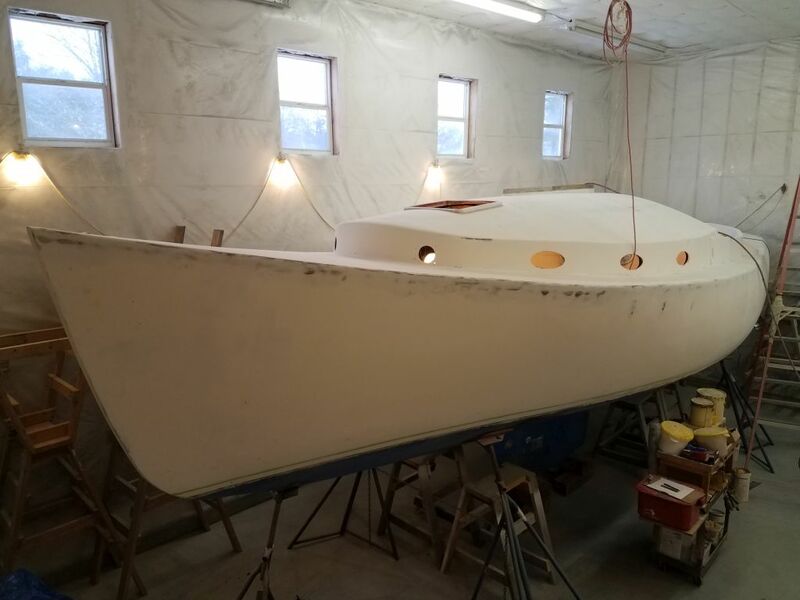 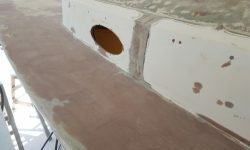 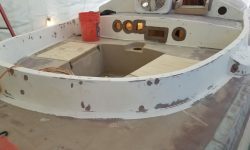 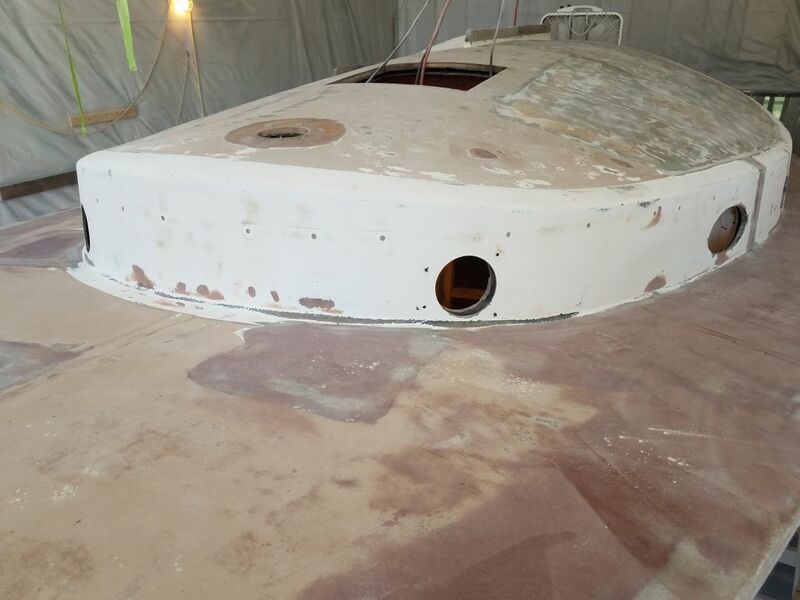 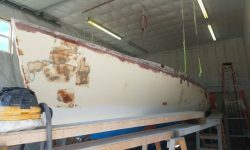 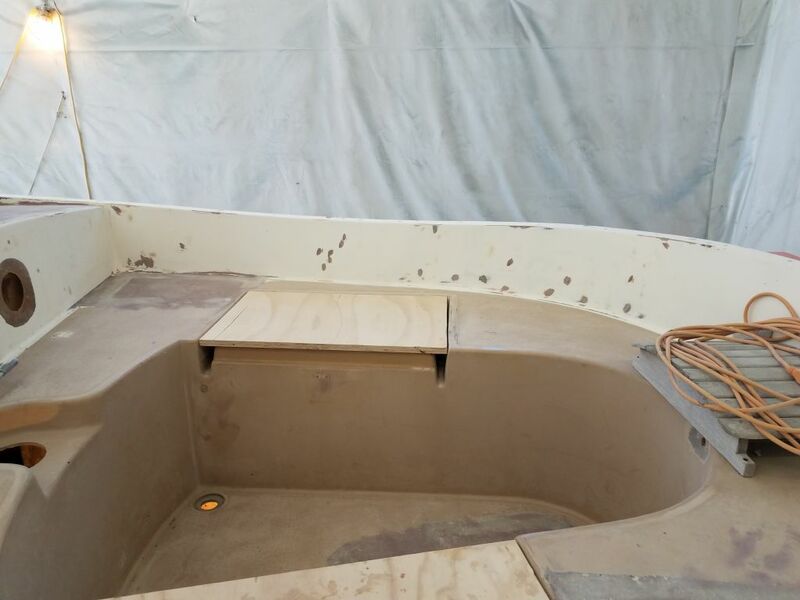 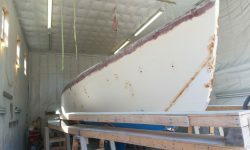 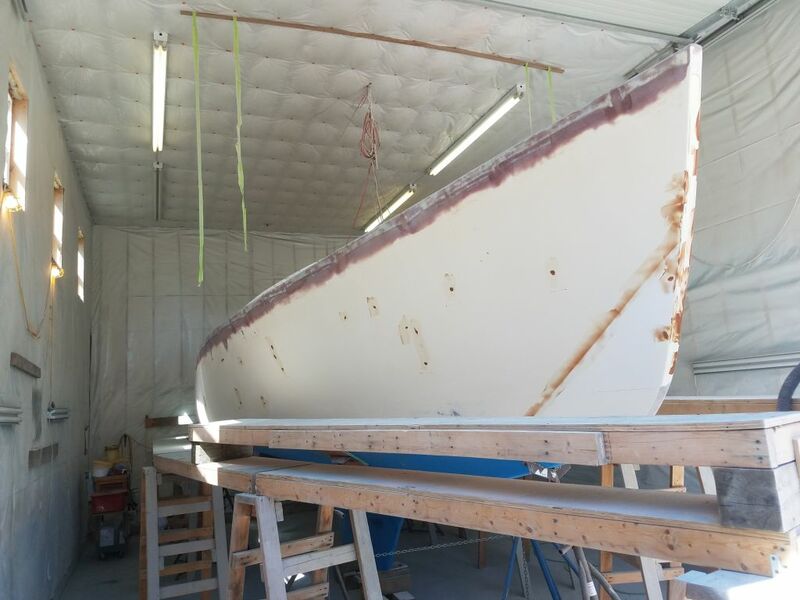 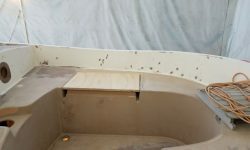 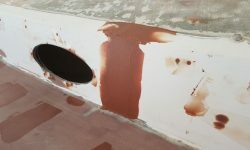 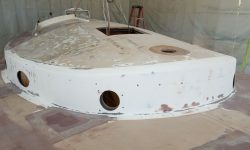 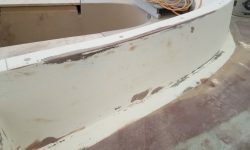 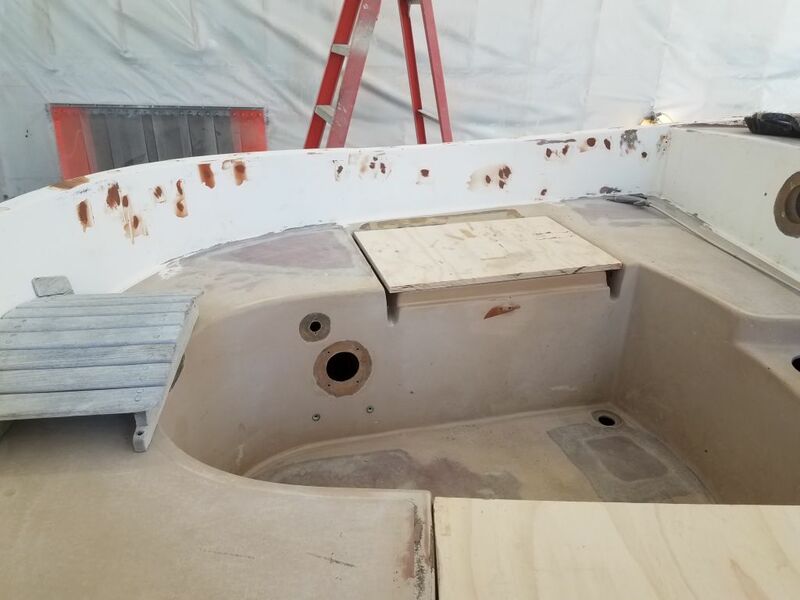 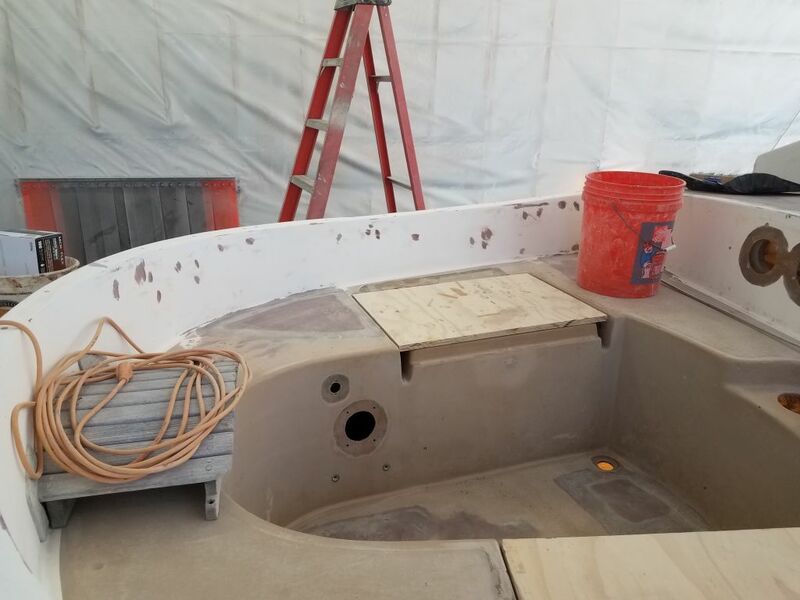 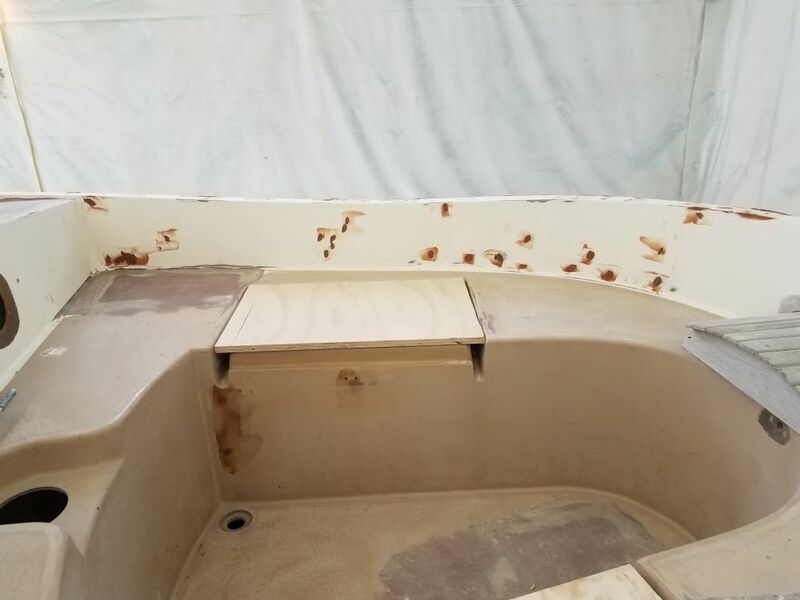 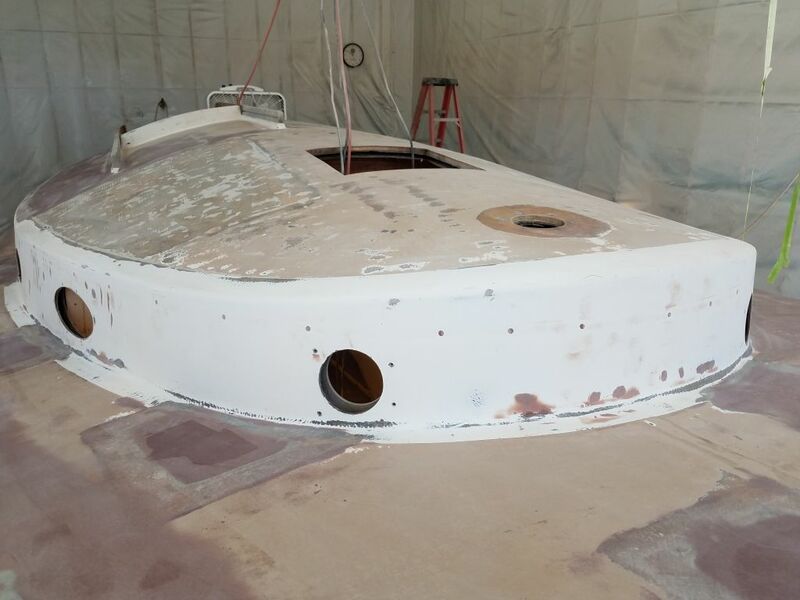 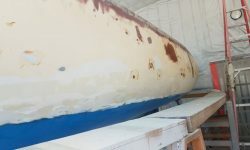 With a bit of time left in the day, I decided to get to work on the through hull openings, which I’d earlier ground out from outside the hull, ready to accept new fiberglass once I’d made some other preparations. 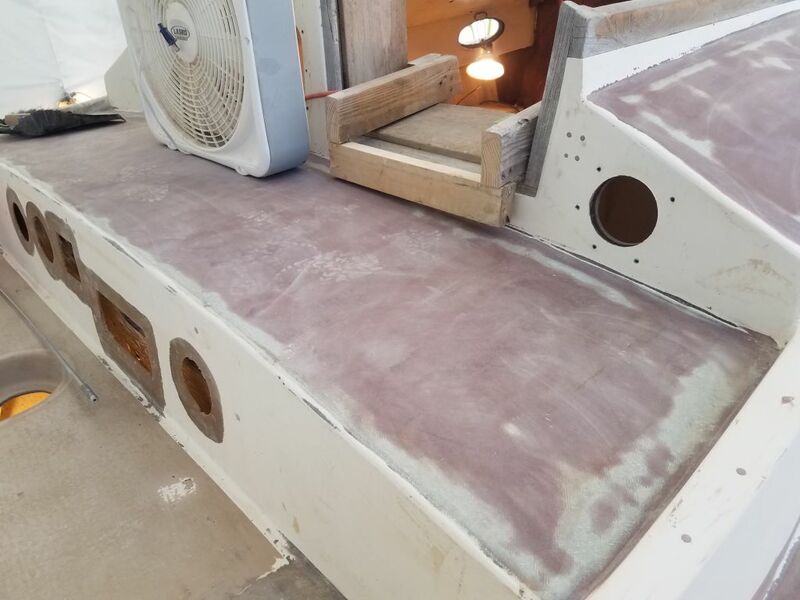 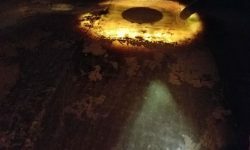 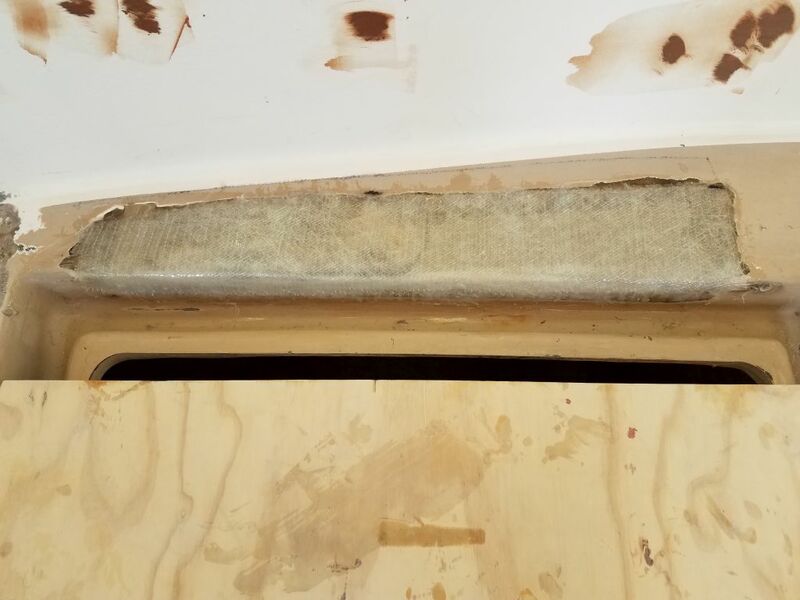 To start, I used a drum sander as needed to clean up the insides of the old holes and remove any remnants of sealant or other contaminants. 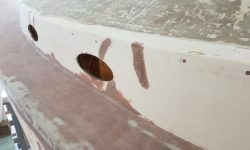 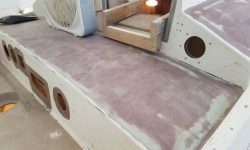 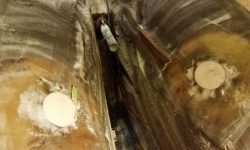 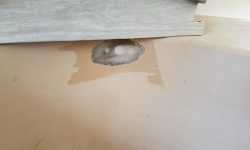 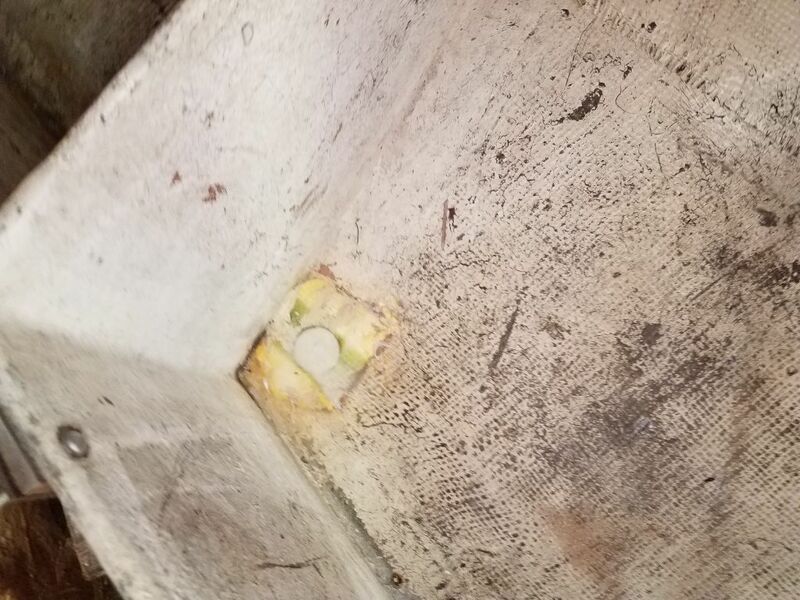 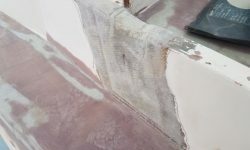 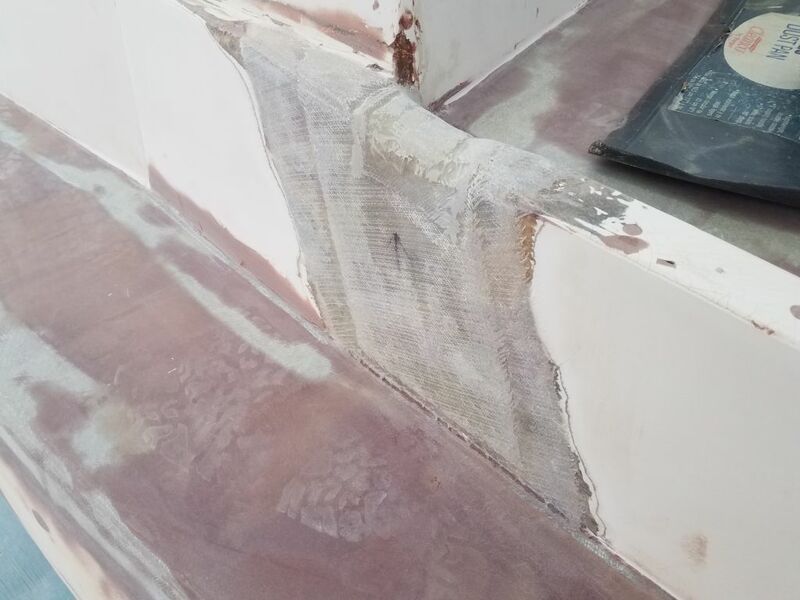 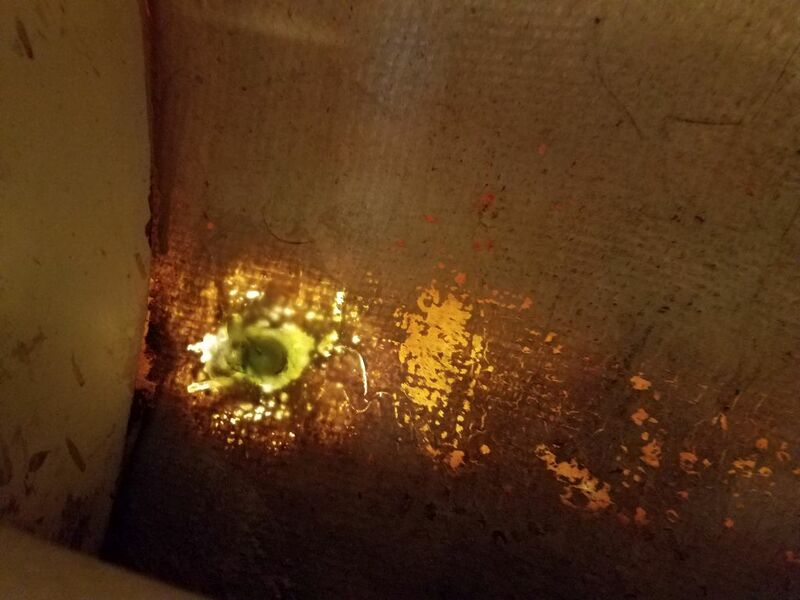 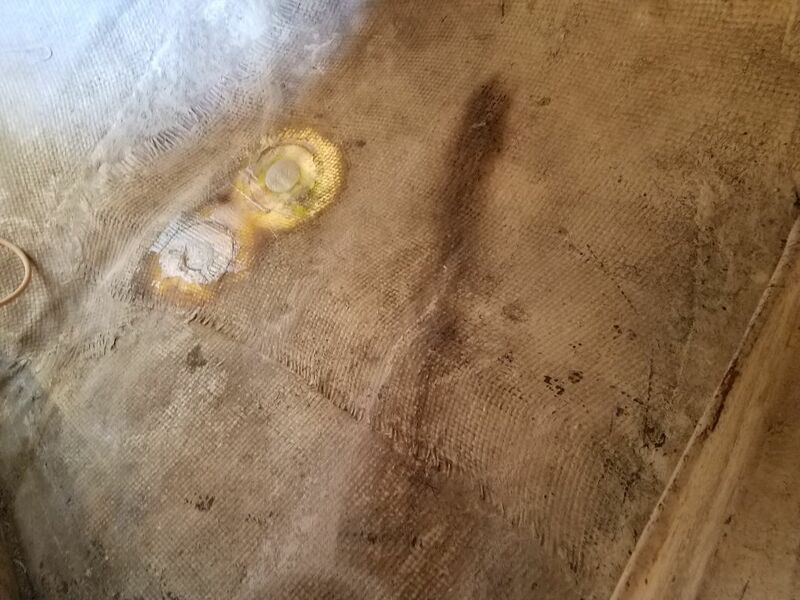 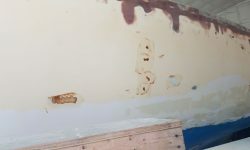 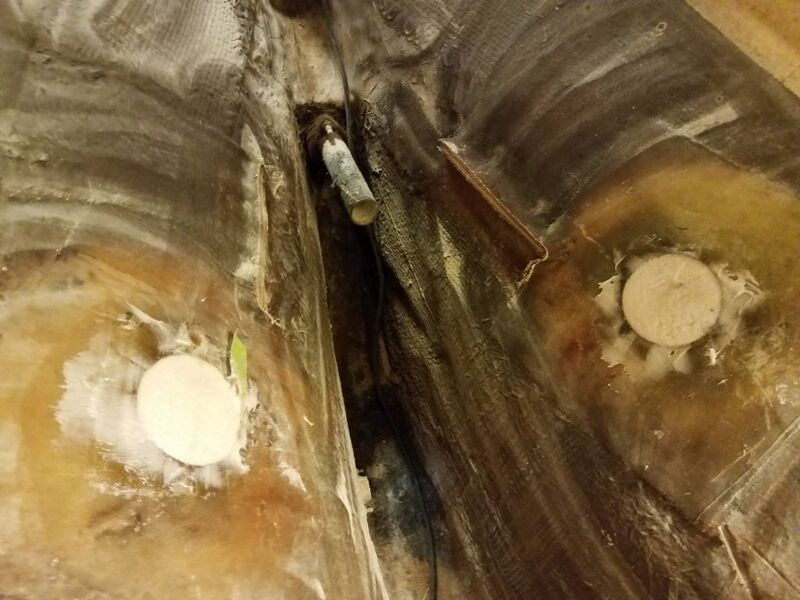 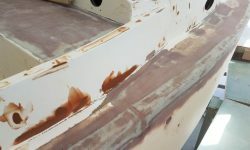 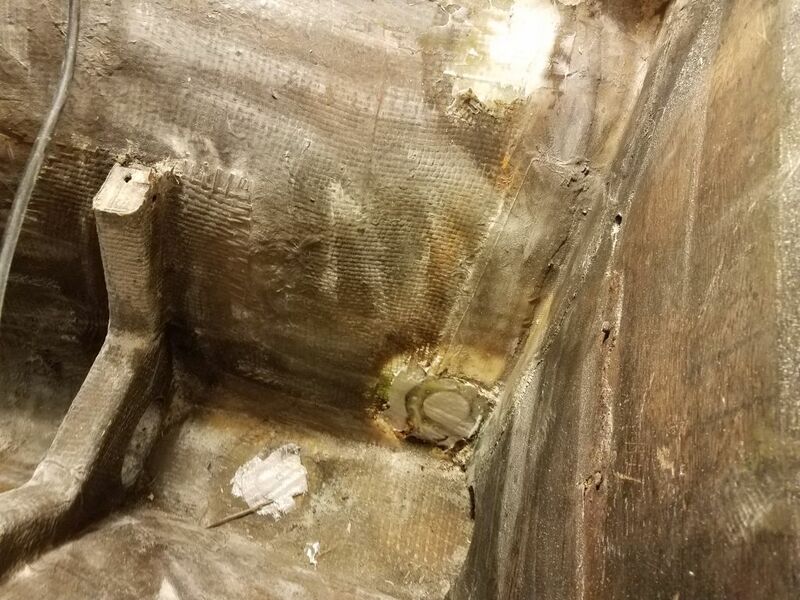 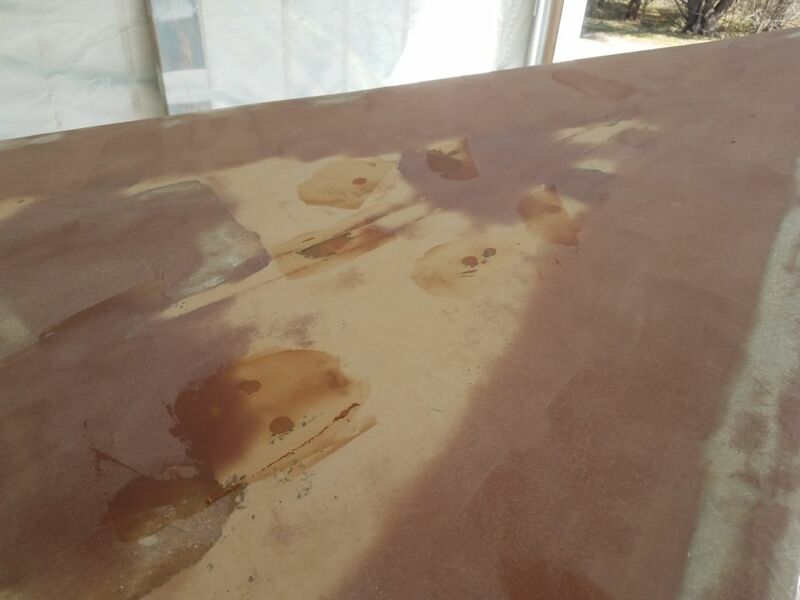 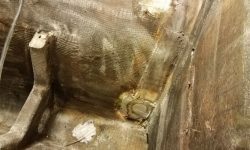 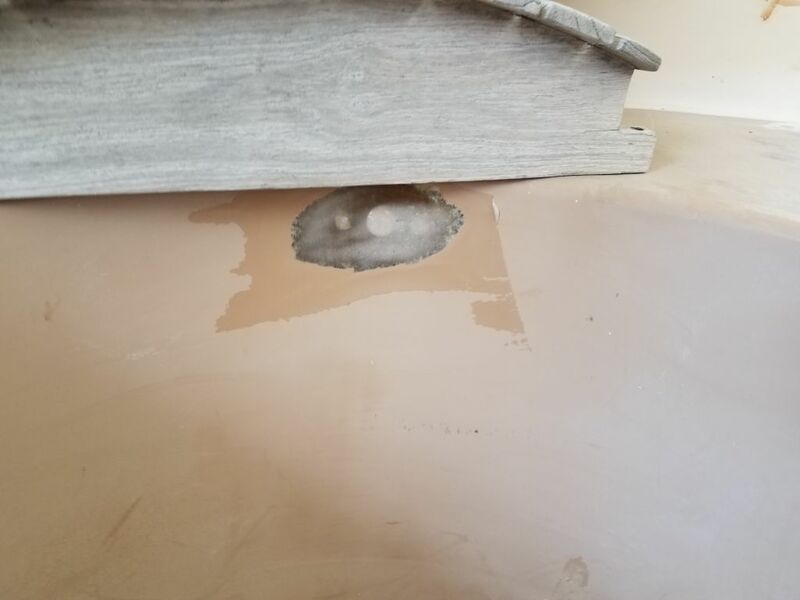 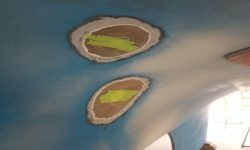 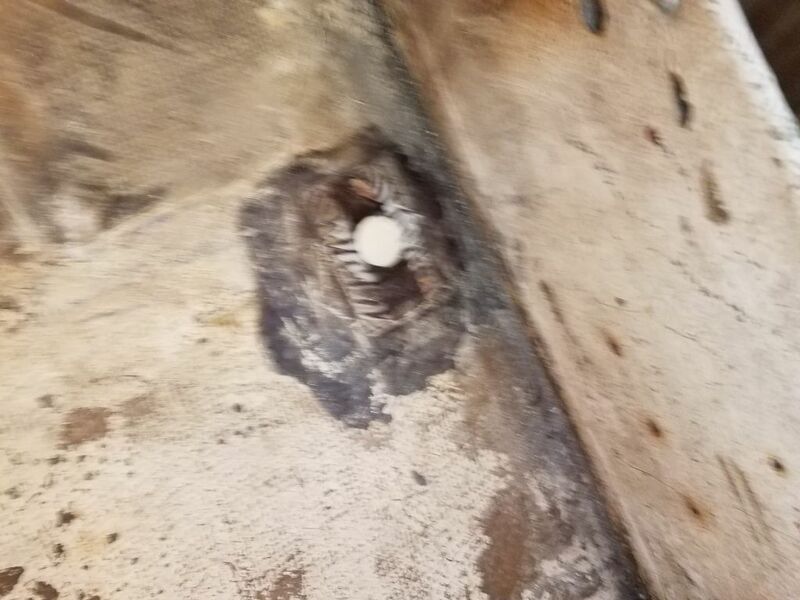 Then, I solvent-washed inside and out as needed, and masked over the openings from outside so I could fill the holes with a thickened structural epoxy mixture as a sort of plug over which I could later laminate the new layers of fiberglass, both outside and inside. 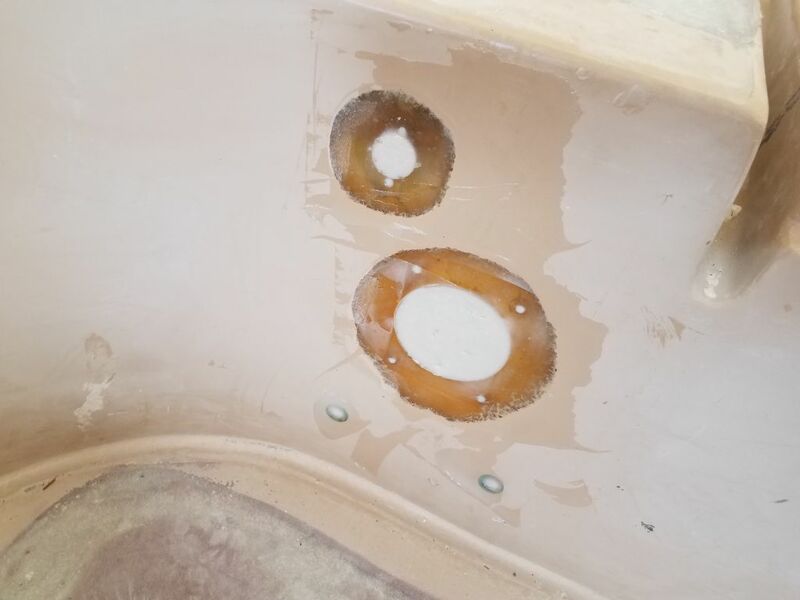 In the cockpit, I similarly filled some larger holes leftover from the bilge pump and other installations, after masking the openings from inside. 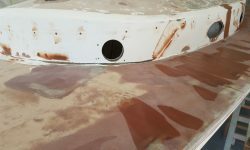 Finally, I prepared and installed new fiberglass over the port cockpit locker edge to repair and reinforce the damaged gelcoat and laminate there, and which I’d ground in preparation out earlier.